Carex barrattii is a perennial sedge 30-80 cm tall, colonial from rhizomes, stems loosely tufted, sharply 3-angled, sides concave. Leaves alternate, blades 0.2-0.4 cm wide, often pale waxy-green. Flowers: uppermost spikes all male (staminate), 3-5 cm long, often purple; lower spikes 2-4 cm long, often drooping, male flowers at top, female below, stalk shorter than spike, bract of lowest spike 2-5 cm long, upper bracts reduced to scales; perigynia pale tan, often with dark tip, about 0.3 cm long, vaguely 3-sided, 2-ribbed, tapered at both ends, beak very small, scale below perigynia dark purplish, about as long as perigynia, achene 3-angled, sides concave; inflorescence of 3-6 spikes on thread-like stalks; blooms and fruits April-July. Frequency in NYC: Rare (G3G4, S1, E). 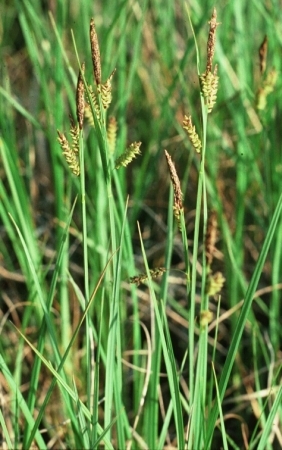 Habitat: Usually in coastal pine-barren bogs. .